The ST Iron package is a completely assembled Ford 9 third member equipped with selected options and shipped ready to install. Cases are constructed from high-grade nodular iron and feature a radial-ribbed design, providing more uniformed support for the pinion and carrier bearings. The caps, also nodular iron, are designed with increased thickness for added strength and ring-gear stability. The ST Iron case bores measure in at 3.0625, matching the OEM large-bearing size for use with 31-spline axles, or 3.25" for use with 35-spline axles. Standard components include Truetrac torque sensing differential, a chromemoly 1350 yoke and Daytona-style iron pinion support. 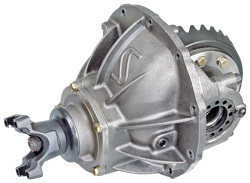 Ring-and-pinion-gear selections range from 3.50-4.57:1. Gears are professionally adjusted when assembled.